Explore the water in a new way on a prone kayak that you lay on and power with your arms. This roomier Bellyak is easier for all ability levels to maneuver and is suited for all types of water. An integrated skeg makes for better tracking and a built-in watertight hatch keeps your stuff dry while you’re out on the water. Dimensions: 103" x 25" x 10"
Bellyak is a prone kayak that makes for a fun new way to explore the water, while also giving you a different perspective. It is built for you to lay on, and is powered by your arms—no paddles needed. The lightweight kayaks are made in North Carolina and have an ergonomic design built to keep you feeling comfortable while you’re maneuvering on the water. There are different styles suited for fresh and salt water, and for different ability levels, too. It’s something both newbies and seasoned kayakers will enjoy trying out. Our CEO, Jules, really enjoyed her time on a Bellyak. 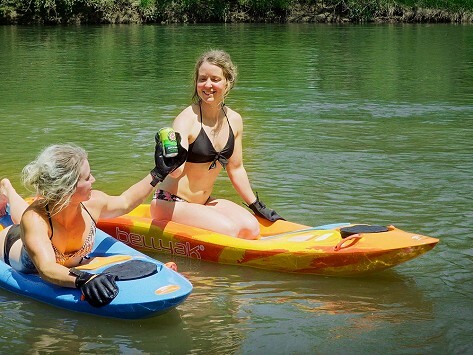 After her paddling trip was over, she liked that it gave her a new way to float on the water. Maker Adam Masters created the prone kayak out of necessity after a hurricane hit his area. The high water and low trees meant he couldn’t sit up in his kayak to get to safety. So he duct-taped the spray skirt over the opening and laid down. This DIY-design helped Adam get out, and he liked how it felt to control it with his arms. Twenty-four prototypes later, Bellyak was born.